I received this button from Stephen Wright who is from Muskogee, Oklahoma. Steve used this button when he served as a District Deputy Grand Master and a member of the Masonic Education Committee for the Grand Lodge of Oklahoma as a reward for creative thinking. One of my favorite quotes is usually attributed to Ralph Waldo Emerson, but in fact was published in 1905 in a book by Muriel Strode. She said, “I will not follow where the path may lead, I will go instead where there is no path and I will leave a trail.” The quote defines what a leader does; takes people and their organization where they may have not been before. It also fits right in with the thinking behind Steve’s button that a leader should not be constrained by what has been done in the past, especially if it has not been effective or is not consistent with the organization’s vision. When a leader envisions a path for an organization it many times requires that he spend a considerable amount to time to convince people that this unknown path will lead to somewhere positive and the sacrifice and hard work to get there will be worth the effort. However in doing so he should be careful not to offend the “But we’ve always done it this way people.” Establishing a positive relationship with those who may resist change is necessary in achieving buy-in for a vision. Here are some thoughts on how to approach these people. Indicate you have some ideas and would like their opinion. Describe your ideas and explain why you believe they will benefit the organization. Be careful not to criticize the way things have been done in the past because it may be perceived as telling the person that they have been doing it all wrong. Find areas of agreement. Look for ways that your ideas improve on long-established practices instead of completely abandoning them. Ask the person if they have ideas for improvement and if they do discuss how they might be a part of your plan. Understand that you are advocating change and it will occur slowly. So don’t try for complete buy-in all at once. Ask for permission to consult with them again as you continue to develop your plan. 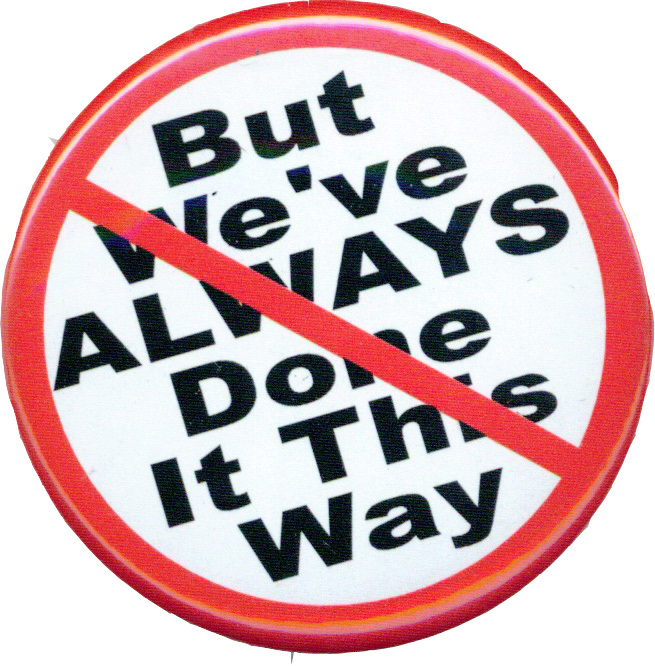 So the statement, “But we’ve always done it this way,” should be looked at as an opportunity for education and discussion rather than an announcement that the person is not open to change. If the person is approached properly it can lead to a better relationship and hopefully to an ally for your plan to effect change.